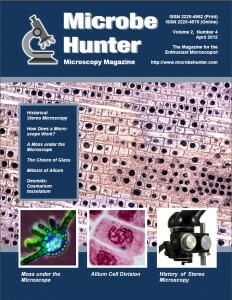 Welcome to MicrobeHunter magazine. You can download the PDF and order a printed version. Here the evolution of stereo viewing leading to the Common Main Objective (CMO) microscope is presented. How Does a Microscope Work? A great deal of optical science is involved in answering this question! A fine project for beginners in microscopy? And you don’t need sophisticated equipment to make ‘good’ photographs. After considering both the telescope and the microscope, I made the choice for the latter. Víctor Rafael Zárate-Ramírez, et al.